Re: Ramps or hitch mounted carrier ? uh...are you talking ramps in the bed of a pickup? 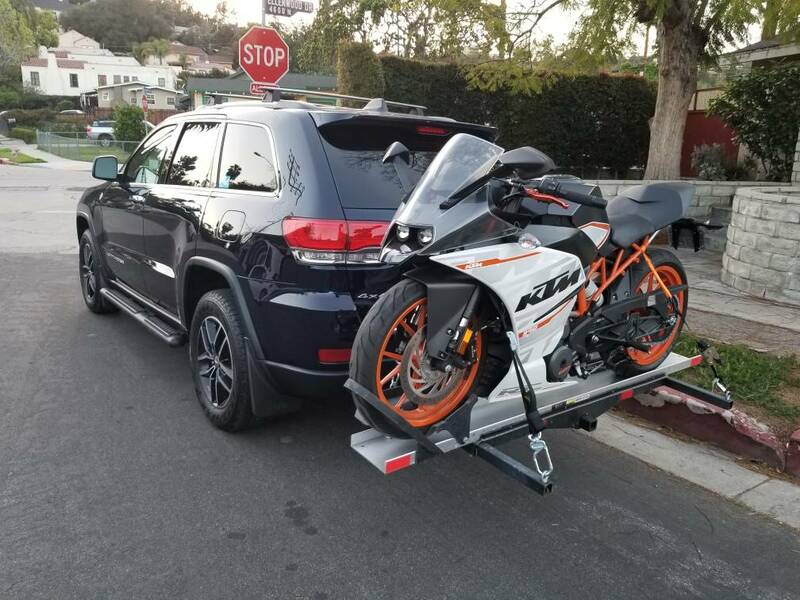 I have an SUV and use a hitch carrier for most bikes under 600lbs. i've used all three methods (carrier, ramps into bed, ramps onto trailer) over the years but for a dirt bike, hitch mount carriers are super handy as long as the vehicle isn't too tall and can handle the tounge weight ... the anti-wobble brackets also help quite a bit. i've had my justhitchit.com carrier for ~13 years. we still use it every trip to the Berkshires on the back of my buddies full-size GMC. works great and leaves more room in the bed for all our crap with one bike in the bed and one on carrier. Last edited by breakdirt916; 02-11-19 at 04:44 PM. I'd rather do ramps. Tried the hitch carrier once. Bike almost took out out the rear glass of my xterra when i was dentensioning the straps. In a truck no issue with that however. I have a ton of miles on my hitch carrier with no issues. Using the right tie-downs is essential. I have used my hitch carrier for my Vstrom, SV and ZX6 with my Silverado. I do have to say loading a bike on a hitch carrier is a walk in the park if the ramp has a chock in comparison to loading into a modern 1/2 ton truck. I trusted mine with an SV strapped in all the way down to Summit Point for a weekend with no worries. The one con I had with my hitch carrier was how much it would resonate when you went over some North East highway bumps. It may be a different story with something smaller like a 250f on the back. If I didn’t get a free single rail trailer I would have kept mine. Last edited by Crconnor18; 02-11-19 at 08:44 PM. That said I bought a truck and now use ramps. It's a no brainer. The bike is out of the way and no worries about ground clearance pulling out some crazy pitched driveway or it somehow slapping the back of the SUV when a hauling mount gives way. With the hitch carrier we used set of add-on tail/brake lights, plugged into trailer harness. I’ve heard anecdotally of people being stopped or ticketed for obstructed lights. I added a cheapie amazon 48" truck bed light strip with turn signals that came with the 4-pin trailer plug and I've never had an issue. It's pictured in my previous post. I much prefer using my hitch hauler or kendon trailer to loading bikes in the bed of my truck. I'm short. Loading dirtbikes in the bed is a drag. Also, two bikes never seem to stay secure in the bed. 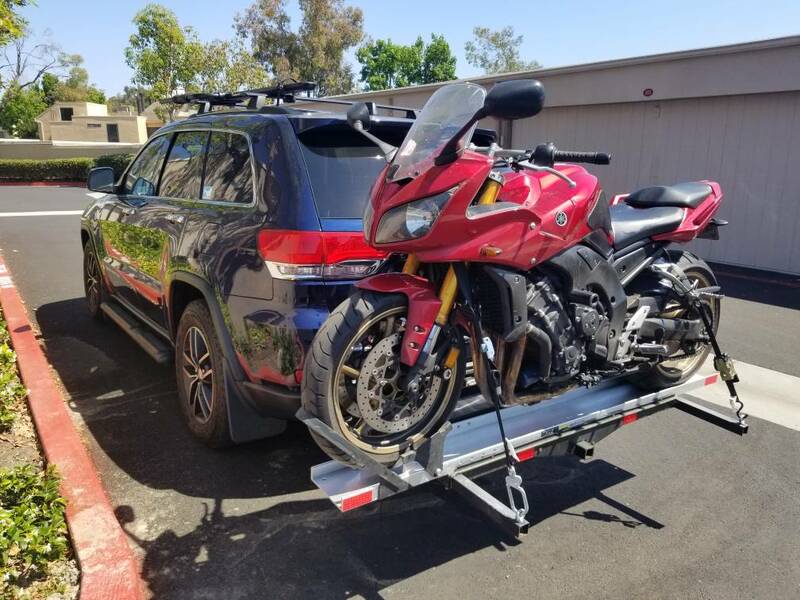 So, 1 bike, hitch hauler, 2 bikes, kendon. But in a pinch, truck bed. I like the width of your carrier, the one I have is much narrower. 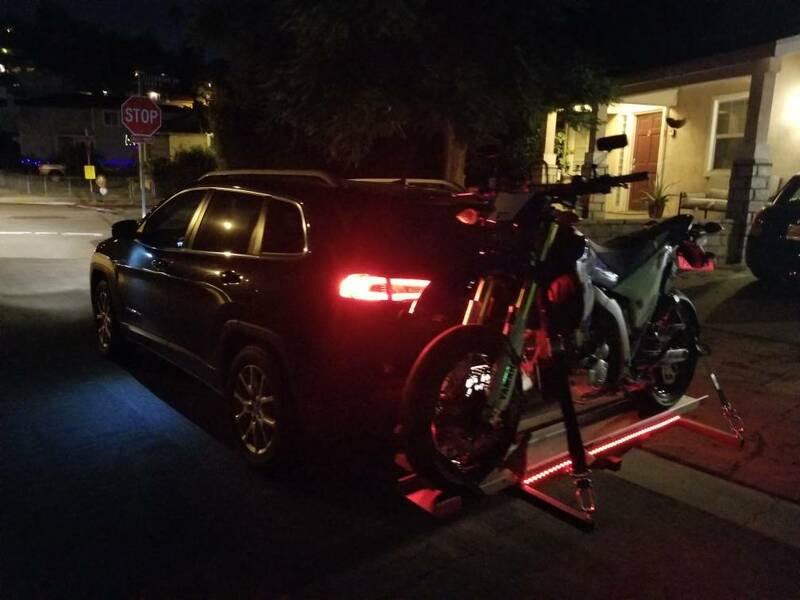 The first time you use a hitch ramp you're nervous as hell but I have a ton (ok not a full 2k lbs - would not ever try to haul my XDiavel..) of faith with mine. Just be sure to use a tensioner so it doesnt rock back and forth on the box receiver. Last edited by CMG241; 02-13-19 at 08:55 AM.